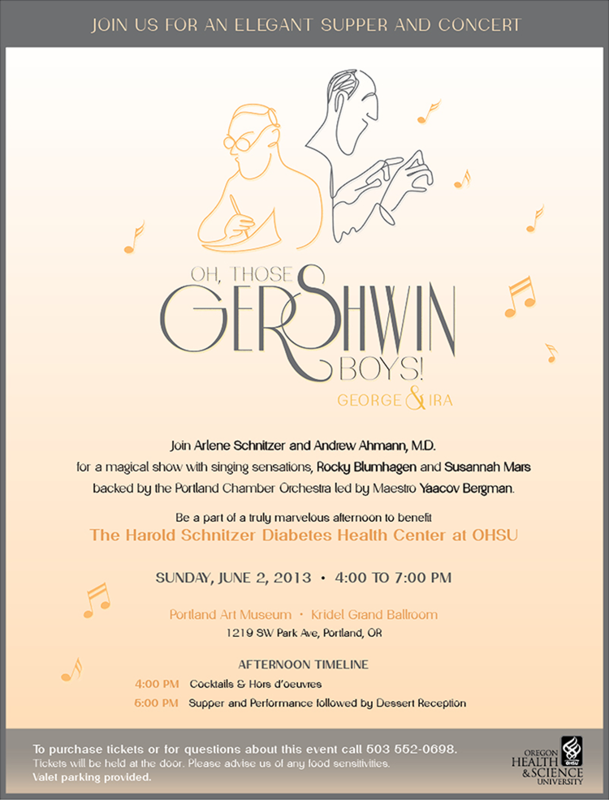 The debut of “Oh Those Gershwin Boys,” a new Gershwin Musical Review at the fundraising gala for the Harold Schnitzer Diabetes Health Center, at Oregon Health & Science University (OHSU). For many Americans, composer George Gershwin is thought to be a national treasure. “Oh, Those Gershwin Boys!” takes you on a musical journey through Gershwin’s 1930’s Broadway shows and the golden age of film. It features Gershwin hits and brilliant gems coaxed from the archives. Gershwin’s music and lyrics are witty, fun and delightfully romantic! 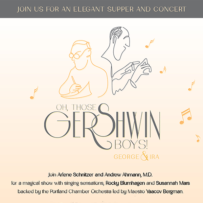 Join us the first Sunday in June for a memorable afternoon re-living the grand Gershwin legacy through the eyes of his brother, Ira Gershwin, and George’s good friend and collaborator, Kay Swift. Harold Schnitzer, was an highly-regarded businessman, civic leader, and philanthropist. Schnitzer is remembered for having made many generous charitable gifts over the course of his lifetime. As a diabetic, who passed away in 2011, he dreamed of creating a center to serve both juvenile and adult diabetes patient groups in one location. Unique in this regard, the Harold Schnitzer Diabetes Health Center, at Oregon Health & Science University, is the beneficiary of this fundraising gala. Lyric Baritone Rocky Blumhagen and Soprano Susannah Mars perform “Oh, Those Gershwin Boys!” This original revue was created by Jack Moore for the Portland Chamber Orchestra, “the intimate symphony with infinite imagination” founded in 1947 and conducted by world renowned Maestro Yaacov Bergman. 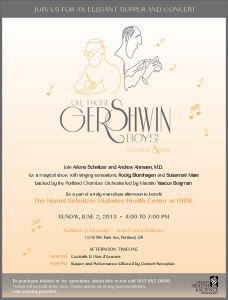 If you plan to be in Portland on Sunday, June 2, 2013 from 4pm-7pm, please join in supporting this worthy cause. Cocktails, an elegant plated supper and dessert. Tickets are $125, call 503-552-0698. See you there!